Harry George (HG) Ellis exemplified the ‘middling sort’ of his times. 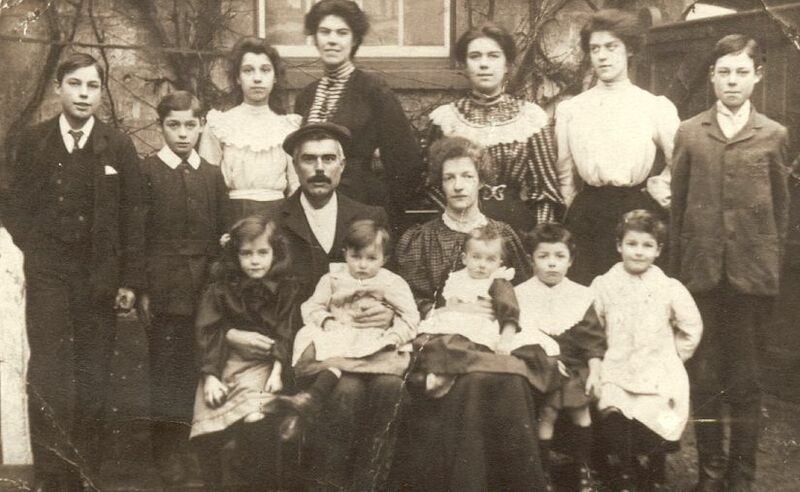 He was born in Campden in 1856 to Henry and Hannah Ellis. Henry was the town basket maker and according to his obituary ‘an ardent politician’ who was very involved in local life. 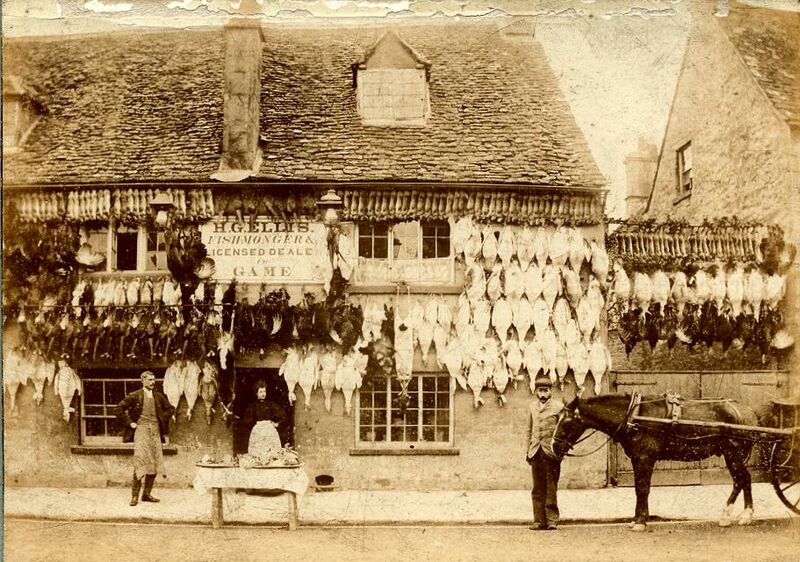 HG trained with his father but on his marriage to a girl from Pebworth in 1884 he set up in business as a poultry and fish dealer in the High Street. 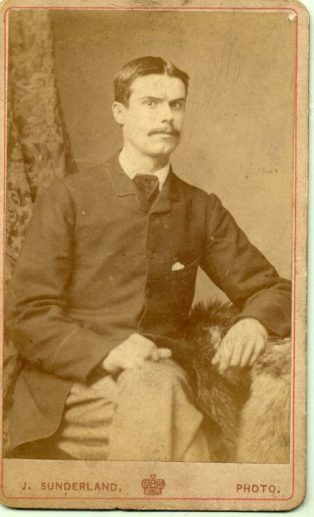 He and Ellen had seven children before she died in 1895. Two years later he married again, to Martha Price, a housekeeper/cook at Farncombe House and they had a further six children. 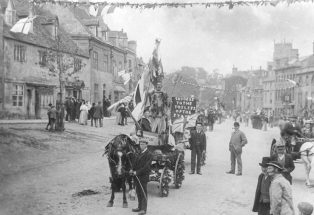 They worked together to run the shop, and at Christmas when all the shops vied with each other to put on the best display the Evesham Journal reported on Ellis’s ‘usual energy in providing a capital show’. 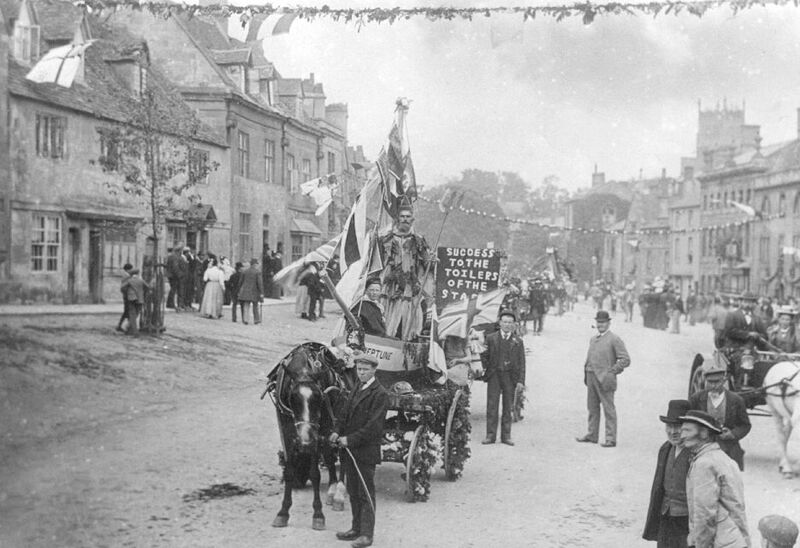 The town’s tradesmen took every opportunity to advertise their goods and services, and the ‘Floral Parades’ of 1895-97 were exceptional displays of decorated floats and bicycles, and HG, as a fishmonger, took the part of Neptune, in splendid costume. Community entertainment was very popular and HG was a regular participant at evenings in the Infant School when tableaux were enacted with appealing or rousing singing. 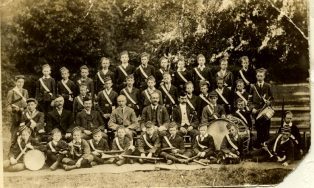 HG’s father Henry was closely involved with the Moreton and Campden (North Cotswold) Rifle Volunteers, formed in 1860 as part of the 16th Gloucestershire Rifle Corps. In 1880, the Corps was renamed ‘K’ company. Each week the Evesham Journal reported the drills and activities of the Corps that engaged many young men of the town. HG joined the Volunteers as soon as he could, at sixteen years old. He rose through the ranks to become Sgt. Instructor and in 1901 was presented with a long service testimonial by the Countess of Gainsborough. Stimulated by his experience in the Volunteer Corps and stirred by the militaristic fervour of the times, HG volunteered for the Boer War in 1899. He was turned down on account of his eight children, but it is amazing that he even contemplated leaving his family, ailing father and business. 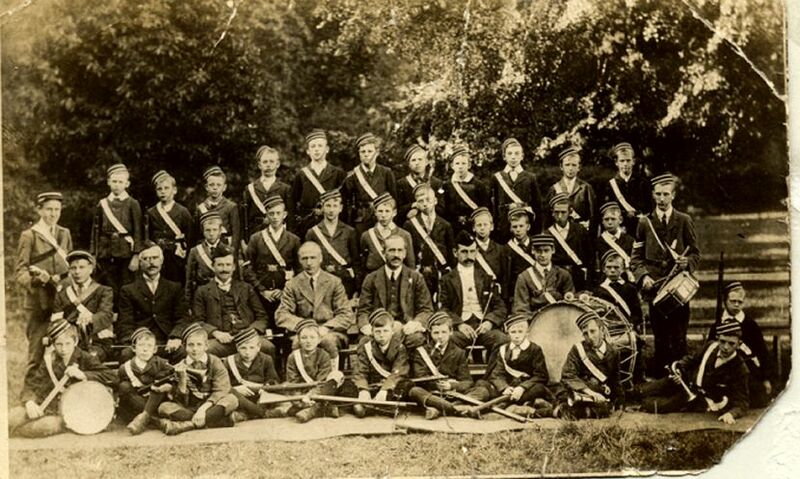 A few years later, in 1909, he and friend Jim Pyment formed Campden Boys’ Brigade and HG was yet again the Sgt. Instructor. Major Skey spoke very highly of the work and energy displayed by the instructor of the Boys’ Brigade in Campden, viz. Ex-Col. Sergt H G Ellis, who was displaying the same energy as he put in years ago into the old ‘K’ Company of Volunteers. Yet still this was not the full military experience that he wanted, so HG remained on the list of the Reserves and at the outbreak of WWI, at the age of 58, he became a sergeant instructor for the 9th Battalion, Worcestershire Regiment. He could only stay until the retiring age of 60 years, but it was probably an ambition achieved. Debating Society ……. Mr H G Ellis thought that the advantages of the society and reading room should be extended to the ladies, and spoke strongly in support of such extension. Dr Dewhurst seconded the adoption of the report [to create a reading room in the refurbished Lower Room of the Town Hall], with the amendment that ladies be admitted to the reading room until the hour when smoking commenced. For his 85th birthday a poem was written and published by Guy Pemberton, a local architect. It is an interesting commemoration of a full life – see below.